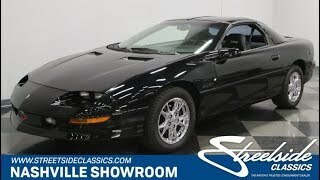 Hi, I am interested in your 1994 Chevrolet Camaro Z28 Coupe (stock #0944-NSH) listed on Autotrader for $10,995. I'd like to get more information about this vehicle and confirm its availability. If you are looking for a high-performance drivers car at an affordable price, this LT1 powered Z28 Camaro might be just the ticket. It backs up the seriously powerful engine under the hood with a seriously capable suspension and brakes. Check it out and give it drive. Then take it home and roll on out in search of some twisty mountain roads or maybe an autocross or two for some heads-up competition. While this car is primarily about performance, its also a good-looking car. Its long, low, lean and gloss black. An orange Chevrolet Bowtie leads the way between a set of fog lights just above a front spoiler that reaches low for the ground. A set of quad headlights are set deep into the bumper under the leading edge of the hood which has a set of scoops cut into it up near the cowling. The windshield is steeply raked back keeping the wedge shape of the body line going all the way up to the tinted T-roofs. The rear hatch glass brings it all back down nicely, flowing smoothly into that beautifully integrated rear spoiler. Viewed from the side, its obvious that the wedge cut of the body was molded and shaped in a wind tunnel with sculpted fenders and aerodynamic side skirts. Mirrors, door handles and other trim are all blacked out with the only chrome on the car being the alloy wheels that look great and provide a perfect complement on a black car. Open the door and you will find a stitched door panel with long clean lines that echo the lines of the body with a long armrest and door pocket that are nice to have while cruising on longer adventures. Then you will probably notice those high back sport seats with Z28 embroidered into the headrests. They are beautifully crafted in leather to be comfortable, but functional, with side bolsters that support the driver and passengers during spirited driving. A leather wrapped tilt steering wheel has perfectly placed pockets for your thumbs and through that wheel you are looking at a tachometer along with a speedometer with higher that usual top ends. Of-course there are also the expected comfort and convenience features too. Air Conditioning, a nice stereo/CD player, power window, locks, steering and brakes. Then, once again, the focus returns to performance with the shifter for the manual transmission thats just begging to be stirred around. Under the hood of this car is the infamous 5.7 Liter LT1 engine. Right out of the box these motors put out impressive HP and torque numbers, they are also very easy to modify to produce even better numbers. They backed up that capability up with a 6-speed manual transmission so you can have fun picking your gear and letting it run. Then the chassis engineers took over and developed a well-balanced suspension system that is tuned for performance with heavy-duty springs, shocks and sway bars for carving up the corners and 4-wheel disc brakes for impressive stopping power. The rubber meets the road through 245/50R16 tires mounted on those sharp looking factory alloys. This is a great driving car and an inexpensive way to get into a potent V8 Camaro. Call or come down and check it out. Then take it home and head out for some fun with it.